GrabPoints is a rewards site that claims to be the highest-paying rewards site on the planet. Is this claim accurate? Let’s find out in this GrabPoints review. It’s really easy to sign up at GrabPoints. All you need to do is go their homepage. Registration is free. If you ever do find a ‘get paid to’ site that requests payment to join, I suggest avoiding these type of sites. Memberships are available to anyone in the world. This is a plus, as often sites like these restrict their memberships to certain countries. Being in Australia I’m often disappointed when I hear about a great new site and I’m unable to join. Their open membership policy has led to their user base growing to over 4 million members in only four years. So those are the basics of GrabPoints, time to move on to how you can actually earn on the site. Like most rewards sites, you earn points whenever you complete a simple task. You will have the opportunity to convert your points to free cash or rewards. GrabPoints does seem to be one of the higher payers surveys among all rewards sites. The earnings for every survey you complete ranges from $0.83 to $0.94. Surveys are assigned to you based on your personal information. It’s’s important to provide correct and accurate demographic information when you sign up so that the surveys are targeted towards you and your preferences. Whenever you finish watching a video on GrabPoints, you will earn $0.008. You can watch one video after another to increase your earnings. For many people, the best way to earn from watching videos is to do so while doing chores, or during their idle time. There are various channels you can pick from, and you can always switch channels. These channels cover a wide range of interests, so you’ll always be engaged. GrabPoints also has a range of offers you can participate in. These offers usually come in the form of free memberships or subscriptions. Some will require an initial purchase, or for you to share your credit card information. Whilst I’m sure all these companies are legit, it’s best to do your homework before sharing your credit card information with any third party sites. You can earn $0.09 up to $10.80 when you fulfill the offer’s requirements. You always have the option of canceling your subscription at the end of the trial period. When you join GrabPoints, you will receive a unique invite code. You can find your invite code in the “Refer Friends” page. Don’t lose this code, because it allows you to earn by referring friends and family to GrabPoints. Whenever they join GrabPoints and enter your invite code, you get up to 500 points, depending on the countries your friends join from. The more people you invite, the more potential you have to earn. So we’ve already covered how much you can earn on GrabPoints. Now it’s time to show you how you can actually redeem the rewards you’ve earned. You have the option of requesting a payout whenever you meet the $3 minimum withdrawal threshold. You can withdraw whenever you reach that amount, or you can choose to save it for a bigger payout. The $3 is easy to reach, with all the tasks that are available on GrabPoints. Many other get paid to sites have a much higher payout threshold, so $3 is pretty good. When you meet those requirements, you have the choice of redeeming your earnings as cash or any of the available gift cards. If you pick cash, it will be sent to you through PayPal. 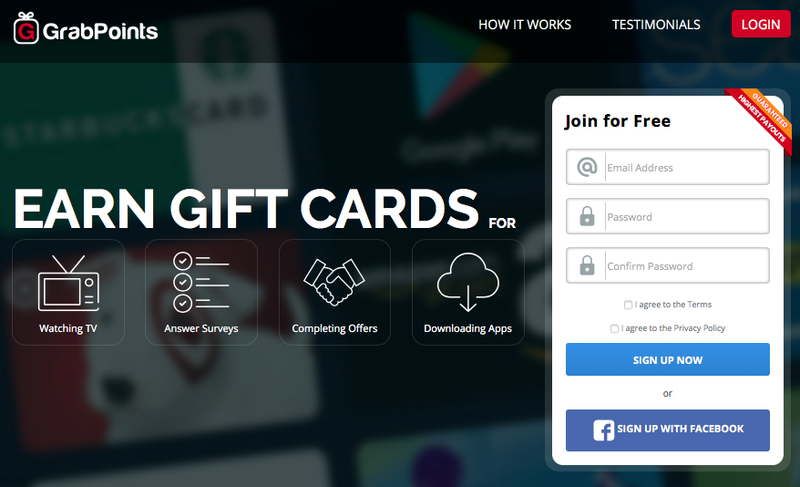 If you request a gift card, GrabPoints has a range of gift cards in their catalog. The options that are available suit a wide variety of interests, from gaming to shopping to entertainment. Below is a partial list of available gift cards – I recommend you see the complete catalogue for yourself. When you’ve chosen your payout option, processing takes 72 hours. As far as get paid to sites go, GrabPoints is an easy way to make some money from the comfort of your own home. Answering surveys, watching videos, and completing offers are pretty enjoyable tasks to do. They have fast payment processing and relatively high payouts, and that makes GrabPoints one of the better get paid to sites. The low minimum payout requirement and fast processing mean you can expect to get your earnings on or before a particular time. For example, let’s say you need your rewards for an important shopping trip this weekend. You can request a payout middle of the week, and know you’ll get your earnings by the weekend. GrabPoints is absolutely legit. If you want to make some quick money online, you should definitely give them a try. Don’t give up your day job to do it, as you won’t earn loads of money, but you will earn some pocket money, and you might have a bit of fun too. With GrabPoints, you can participate independently, and according to your own schedule. For anyone who wants to test whether you can really make money online, this is a good introductory way to confirm that you can. If you’re looking for some extra money and some fun along the way, then GrabPoints might be for you. I love to help people build confidence to know that there are ways to make money online that are legitimate and can work for them if they choose. If you’ve discovered any other ways to make money online that have worked for you, then please share your experiences! I’m always interested in hearing about legitimate platforms that help people make money online.